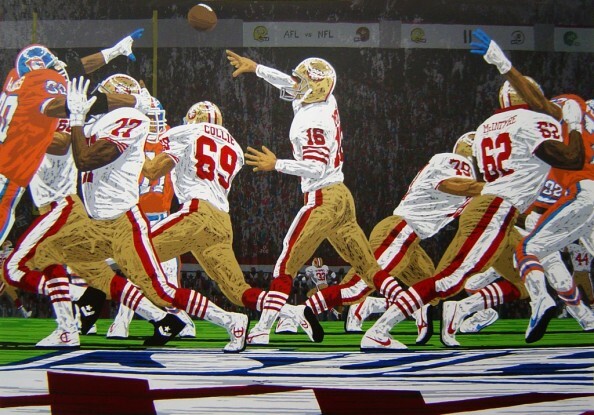 Looking for any reason to feel comfortable about heading into the Super Bowl, the San Francisco 49ers have three players featuring among the top 10 MVP performances: Jerry Rice, Steve Young and Joe Montana, beating other memorable games by the likes of Marcus Allen and Phil Simms. 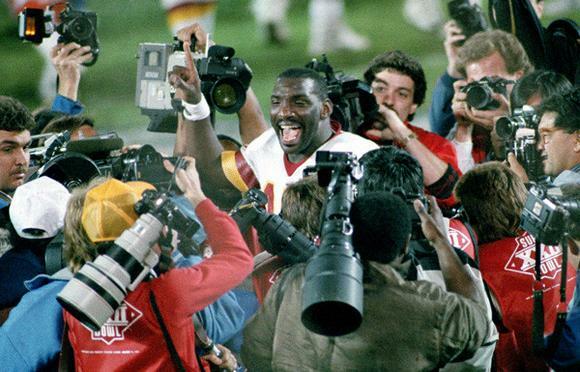 In hindsight, it wasn’t Williams that deserved to win the MVP of that game, but Timmy Smith who ran for 204 yards and two touchdowns, but it was impossible to avoid all the buzz around Doug Williams, who threw for 340 yards, 4 touchdowns and an interception. The Redskins beat the Broncos 42-10 on that day in San Diego, including 35 points in the second quarter after the Broncos led 10-0 after the first. Williams outdueled a stunned John Elway, intercepted three times, completing only 14 of his 38 passes on the day. The 10 point deficit remains the largest deficit overcome by a Super Bowl victor. Swann caught only four passes in the 21-17 win against the Dallas Cowboys, but finished with 161 yards and a touchdown, not to mention possibly the most memorable catch in Super Bowl history. No, it wasn’t the 64 yard pass for a touchdown that gave the Steelers a 21-10 lead, while quarterback Terry Bradshaw was still picking the pieces up from a vicious blitz. Swann caught a 53 yard pass in the most acrobatic of fashions, setting up the Steelers with a field goal. Riggins ran for 166 yards on a massive 38 attempts, scoring one touchdown. His biggest moment came with 10:10 left in the game and the Redskins trailing 17-13; facing a fourth and one, Joe Gibbs called his trademark play I-Right 70 Chip, starting TE Clint Didier in motion towards the right, then reversing motion back to the left. 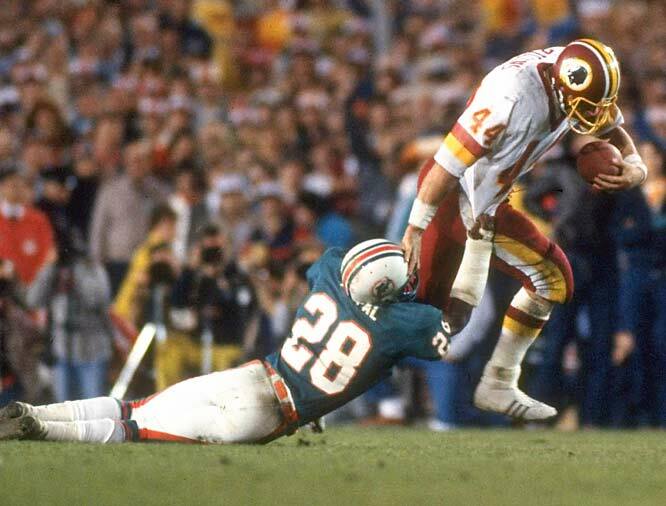 Theismann handed to Riggins who broke a tackle from Miami cornerback Don McNeal and took off for a 43-yard touchdown run. Washington led for the first time in the game, eventually winning 27-17. 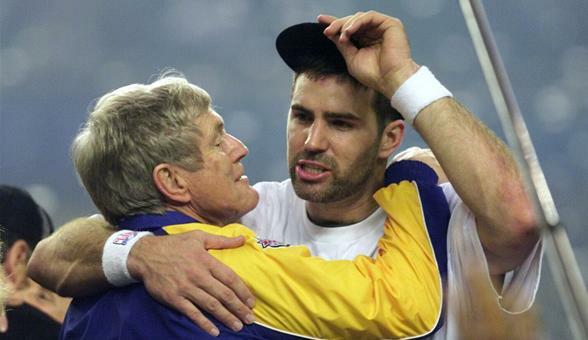 One of the biggest cinderella stories in the NFL has to be Kurt Warner, making two Super Bowl games and leading the St. Louis Rams to a dramatic 23-16 win against the Tennessee Titans. The Rams’ offense didn’t click perfectly in the final game, but Warner did finish with 414 yards and two touchdown passes, including a 73 yard touchdown pass to Isaac Bruce, catching the ball on the Titans’ 38, giving the Rams the go ahead score. The most famous moment of the game was a bit later, as the Titans made one last effort to send the game into overtime: Kevin Dyson rolling towards the end zone, and linebacker Mike Jones stopping him about a yard short, as Dyson was stretching himself to make the end zone. Jerry Rice owns pretty much every receiving record in Super Bowl history, but his finest hour came in the 20-16 win against the Cincinnati Bengals, mostly known for the 91-yard drive Joe Montana led in the final quarter, ending with a touchdown pass to John Taylor with 34 second left in the game. Rice was the consistent performer in the game, catching 11 passes for 215 yards, catching one for a touchdown. 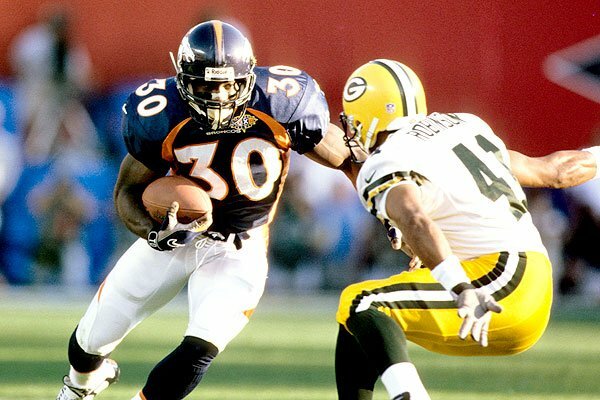 Terrell Davis had a great career cut short by too many injuries, but he did have quite a few shining moments, including leading the Denver Broncos to their Super Bowl victory, beating the Green Bay Packers 31-24. He scored three touchdowns in the game, including the game winning one with 1:45 left to play. He also ran for 157 yards. 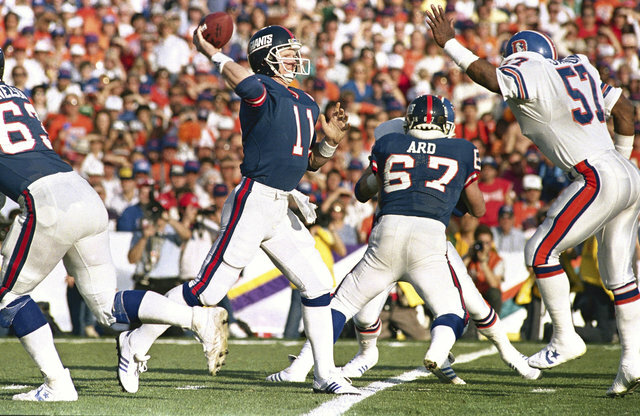 The Giants won their first Super Bowl ever with Phil Simms guiding them on the field; his numbers weren’t huge: 268 yards and three touchdown passes. But Simms simply could do no wrong when he threw the ball, also running for 25 yards on 3 carries. He completed 22 of his 25 passes, setting a Super Bowl record that last till this day and a postseason record that stood for 21 years. 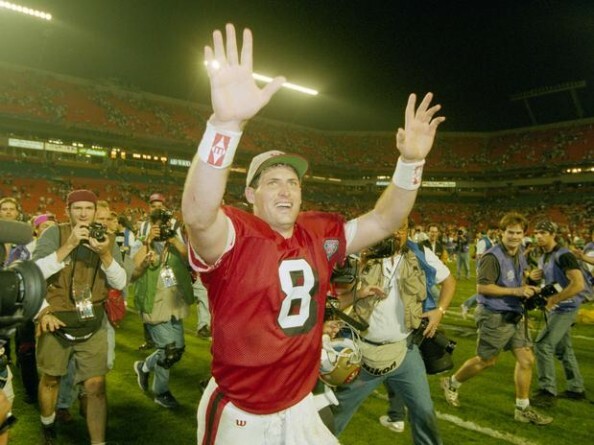 Young needed a long time to come out of Joe Montana’s shadow, but it paid off big time when he led the San Francisco 49ers to their only Super Bowl (until now) without Montana at the helm. The 49ers ran all over the outmatched San Diego Chargers, and Young set a new Super Bowl record with six touchdown passes. He was also the leading rusher in the game with 49 on 5 carries. 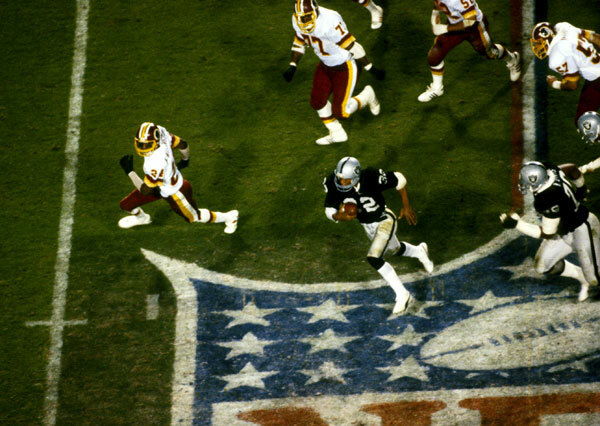 The only time the Raiders won the Super Bowl as an LA team went on to be known as black Sunday, with the Raiders running all over the helpless Redskins, winning 38-9, setting a still-standing record of most points scored by an AFC team in the Super Bowl. 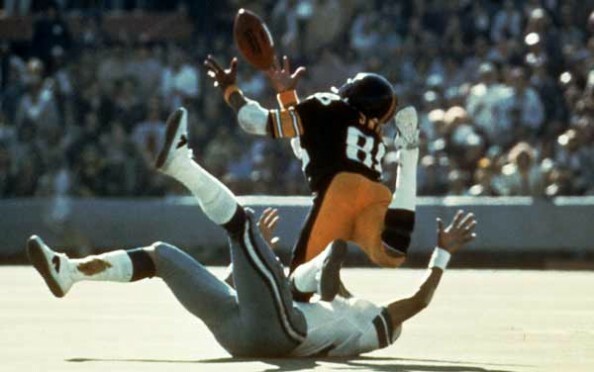 Marcus Allen got to star in the day, running for 191 yards on 20 attempts, more than half the Raiders’ production on the day, also scoring a couple of touchdowns. The greatest Super Bowl quarterback of all-time won the MVP award three times, but his finest performance came on the last time he made the big stage, as the 49ers won their fourth title in 10 years, all with Montana, demolishing the Denver Broncos 55-10. This game remains the most lopsided game in Super Bowl history to date. San Francisco’s 55 points were the most ever scored by one team, and their 45-point margin of victory was the largest ever. Montana completed 22-29 for 297 yards and five touchdown passes, then a Super Bowl record; he also set a record by completing 13 consecutive passes during the game.